Home/ Building Technology Guide / How to Stop Moisture in Concrete Floor? Commonly, concrete floors are vulnerable to moisture and suffer from different detrimental influence of moisture such as lifting tile off the floor, rotting hardwood, damping carpet, coating delamination and many more. These problems are not only disrupting functions of the building due to maintenance operations but also costly. Therefore, it is recommended to implement necessary measures to stop moisture in concrete floors. Several techniques are available which can be applied based on the condition under consideration. By and large, every problem can be tackled provided that the source of the problem is identified. 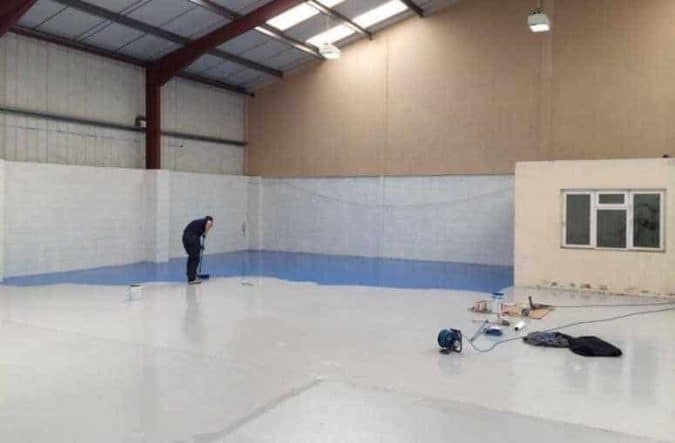 On this base, suitable prevention method or combination of methods are specified to cut the anticipated source of moisture in given concrete floor. Free water in concrete and rising moisture from below concrete are the source of moisture. Factors that lead to moisture accumulation in concrete and subsequent related problems include fast track construction schedule which does not allow free water to evaporate naturally, inadequate moisture protection, and wet construction site. Moisture prevention techniques are available for slabs that is already constructed and experienced moisture and newly constructed slabs. A Low-permeance vapor Barrier or retarder can effectively keep below-slab moisture from reaching the flooring system. In this technique, a layer of sand with certain thickness is placed, after that, a strong and highly durable plastic such as polyethylene is laid, then another layer of sand is installed above the plastic sheet. After that, the construction of concrete floor can be carried out. Any material used below slab to prevent the movement of moisture from ground into slab fall in this category of moisture prevention method. Sometimes, providing adequate time for natural drying of concrete slab would solve the problem. In this case the concrete slab shall be tested prior to the installation of tiles, coatings, or paints. Keep below grade excavations free of water to prevent potential reservoirs of moisture that can migrate upward through slabs. Excessive moisture below concrete slabs can cause structural degradation of soil bearing strengths, and swelling and shrinkage of soil. These can adversely affect a concrete slab on grade. In this method, damping agent (such as liquid epoxy damp proof membrane) is applied for an existing concrete floor system. It is used for slabs that suffered moisture problems due to lack of moisture prevention means or failure of moisture prevention system. The damping agent creates an impermeable layer and hence keep moisture in concrete slab. Not only does it provide visually good surface finish to the floor but also it can be applied without any concern regarding drying the concrete slab.